I am not sure what came first and what takes up more space – his music or his art. 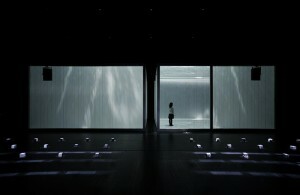 In Carsten Nicolai’s or Alva Noto’s case music and art seem to complement each other perfectly. 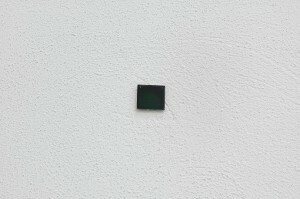 His works are minimalistic, polished and exact, they are black and white (with the exception of the occasional cold blue), they are based on scientific principles and nature’s underlying order, explore human perception and our role as observers in the quantum world. 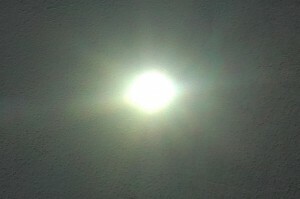 A spot of the darkest existing black to date (absorbing up to 99,7% of light) is positioned opposite a ultra bight spot caused by a white laser beam. The visitors are positioned between those two poles in an area of transition. 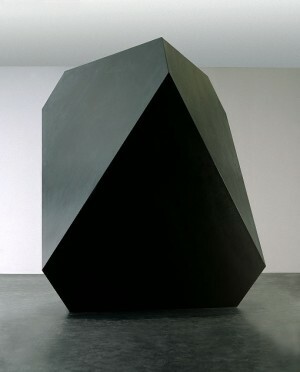 Based on the truncated rhombohedron appearing in Albrecht Dürer’s ‘Melencolia I‘ (1514) engraving, Nicolai’s black monolith-like sculpture functions as theremin and reacts to the presence of visitors. Mysterious in shape and function, the monolith represents the interrelationship between mathematics, optics, art and philosophy. Inspired by the spatial irritation of a Japanese concave room, ‘aoyama spaces’ is a series of scaled down models of imaginary room installation. The spaces are composed from curved surfaces, incisions, etc. and illuminated by lights that are triggered by composed electronic sounds. 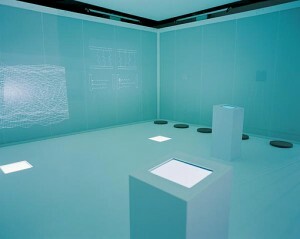 The series explore human perception and questions subjective modes of spatial interpretation. The propane gas in translucent tubes is set on fire, causes a rapid explosion which can be herad as a sonic boom. 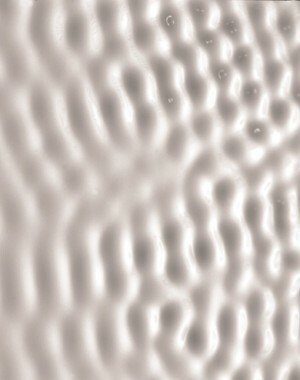 A study of chaos and order, Nicolai shows the influence of sinus waves onto liquids – cymatics. Here the surface of milk forms into patterns responding to the audio frequency – a study exploring the interrelation between acoustic signals and visual patterns. The rotation of an array of LEDs attached to cable strings causes the sensation of lights rings. 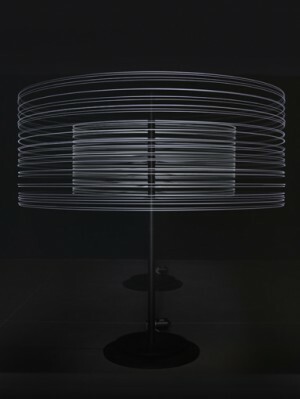 The visual superimposition of two such light ring sculptures result in ever-changing light moirés. The installation consists of elements – lenses, magnifying glasses, light bulbs – pointing to an existence beyond our realm of perception. 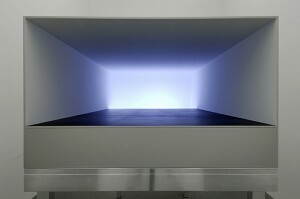 The soundscape combines pulsating radio waves of dying suns and noise from a magnet spintomograph scanning the human body. Man and the universe, we examine the smallest particles to gain knowledge about the origin of the vast – the universe. 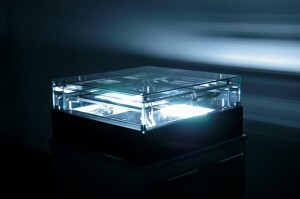 A diffusion cloud chamber filled with ethanol steam allows to witness randomness – particle traces caused by the earth’s natural radioactivity. 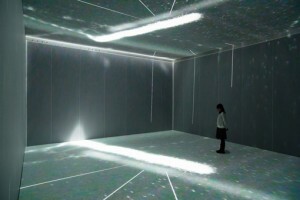 Inspired by Tarkovsky’s ‘Solaris’ the installation places the visitor isolated in a white space where sensors, lights, sounds and visual patterns seem to be connected in complex ways. More questions are posed than answers provided, and reflects on the message of ‘Solaris’ – that the human exploration of the cosmos is more concerned with finding reflections of our own civilization and not with alien worlds. A universe of its own, polar m [mirrored] reflects the human quest for the fundamental truths of our physical world. Technology (cloud chamber, high frequency radio receivers, geiger counters) translate processes of nature into the scope of human perception (visual and audio signals). 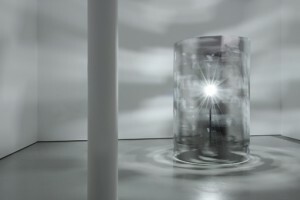 The installation questions the edges of perception, the uncertainty principle, the role of the observer and the limits of understanding our environment. 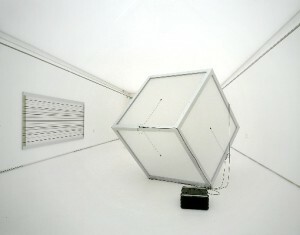 Visitors can enter into the rhomboid sculpture that is filled with filtered white noise. 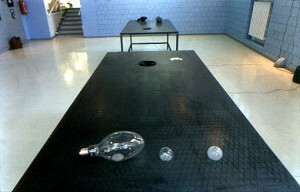 The sound creates the auditory illusion of a sculpture within the sculpture. 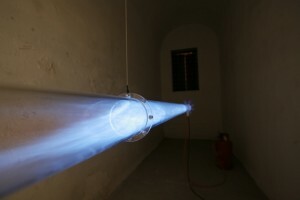 A modern dreamachine – the rotation of a cylinder perforated and carved with a honeycomb structured around a cold light source causes a stroboscopic visual effect that is also transformed into audio pulses. Posted in Inspiration and tagged Carsten Nicolai, cloud chamber, cymatics, dreamachine, Marko Peljhan, observer, perception, quantum theory, sculpture, sound.